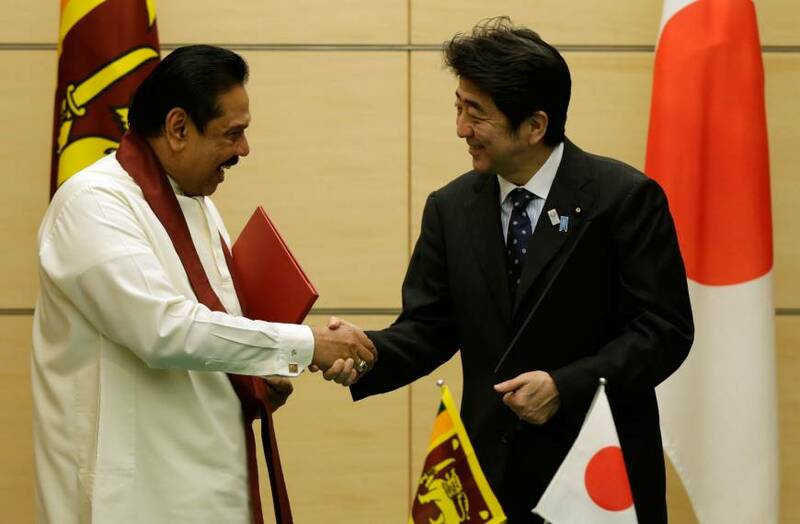 Former Sri Lankan President Mahindra Rajapaksa meets with Prime Minister Shinzo Abe in Tokyo in 2013. “Hoole does not exonerate the Sri Lankan military and indeed, at considerable personal risk, he has meticulously reported on their war crimes and human rights abuses. But, he argues, the state’s sins are well known and widely reported while the LTTE’s grisly record has not received the attention it deserves, especially now that many Tamils are glorifying the Tamil Tigers. Hoole asserts that the LTTE had a number of chances to cut a deal with the government that would have been acceptable to the Tamil population, but walked away from compromises that would have spared the nation so much sorrow and loss. The fact that Hoole – co-winner of 2007 Martin Ennals Human Rights Award – recently resigned from his position at Jaffna University in response to what he regards as the mounting institutional embrace of a ‘Tamil victimization identity’ (and was nearly prevented from holding a launch event for his new book by the Vice-Chancellor of the selfsame unvirsity) tells us plenty about how it is likely to be received in those sections of the Tamil community unable or unwilling to examine the sins of the (Tamil) forefathers. Not that the book’s reception in Sinhalese quarters is necessarily going to be much better. The government, and in particular the armed forces and the many war crimes and widespread human rights abuses they commited are such that they don’t come out looking much better. All these were documented in the many University Teachers for Human Rights – Jaffna (UTHR-J) reports that Hoole has authored or contributed to over the years, which form the basis for considerable sections of the book.